Lucy is feeling sorry for herself because everyone has apparently forgotten her birthday. Mrs. Trumbull's efforts to cheer her with a small cake and some confetti meet with only gloomy enthusiasm. Lucy decides to take a walk, leaving Little Ricky with the elderly neighbor. Ending up in Central Park, Lucy is confronted by a motley group of musical itinerants known as the "Friends of the Friendless". They learn of her plight and offer a brassy chorus of "Happy Birthday". Her fury rekindled, Lucy decides to teach Ricky and the Mertzes a lesson in "the true meaning of friendship" and enlists the aid of the friendly band. Pounding a bass drum, Lucy marches into the Tropicana with her new friends. Standing bravely before the well-dressed audience, Lucy offers her tale of woe: "I was just a bit of flotsam in the sea. I was a mess." As she looks about the nightclub, she recognizes the faces of her dear friends, the Mertzes, the Orsattis, the Sedgwicks, the Morgans, who jump up and yell a Happy Birthday surprise. Lucy is overwhelmed as Ricky says, "I've got a wonderful present for you. Do you want to hear it?" Ricky sings the "I Love Lucy" theme song while Lucy, tears streaming down her face, is given presents galore. Finally, she drops them all to plant a big kiss on Ricky's glowing face. Special Notes: This was the only time the theme song lyrics to "I Love Lucy" were heard. The words were written by Harold Adamson. Columbia Records released it in 1953 with "There's a Brand New Baby at Our House" on the flip-side. 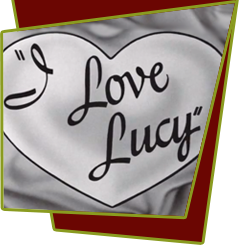 This episode is based on lucy's radio show, My Favorite Husband, Episode #106, "Liz's Birthday". Bloopers: During the first music scene, Ricky has both his trombone players, but in the second scene, one of them is missing and later shows up again with the "Friends of the Friendless" marching band.